His term of office as Judge expired on 10th March 2007 – by termination of the charge period. He was re-elected Judge of the Constitutional Court by Parliament on 19th February 2007, from 11th March 2007. 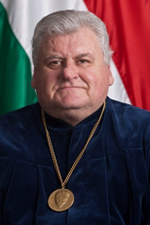 He graduated from the Faculty of Law of the University of Pécs. Since 1975 he has been lecturing at the Department of Constitutional and Administrative Law, of which he became Head in 1993. Having received his candidate’s degree in 1982 and an academic degree in Law in 1992, he was awarded full professorship in 1992. As a Humboldt fellow, he spent 1988 and 1997 at Philipps University in Marburg. At the moment he is teaching Constitutional Law, Administrative Law and the Theory of Legislation at the Department of Constitutional and Administrative Law of the University of Pécs.